The Magic Chef 27 lb. 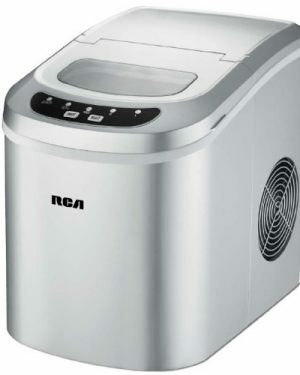 Ice Maker can make up to 27 lbs. of ice per day to help provide you with a steady ice supply. It is just what you need to continuously fill your ice bucket or beverage pitchers when you are entertaining friends and family. The ice maker can conveniently hold up to 1.5 lbs. of ice at a time, and the digital control panel indicates when the storage bin needs to be emptied. 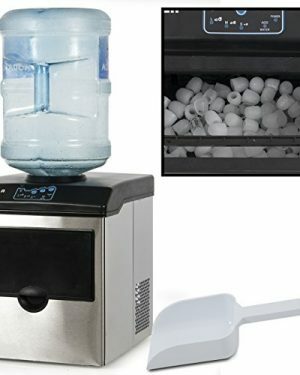 The ice maker produces ice in 2 sizes in as little as 7 minutes, and features a compact design that helps make it easily portable. Efficiency: Makes batches of ice cubes in about 6 minutes. Produces up to 26 pounds of bullet shaped ice per day. 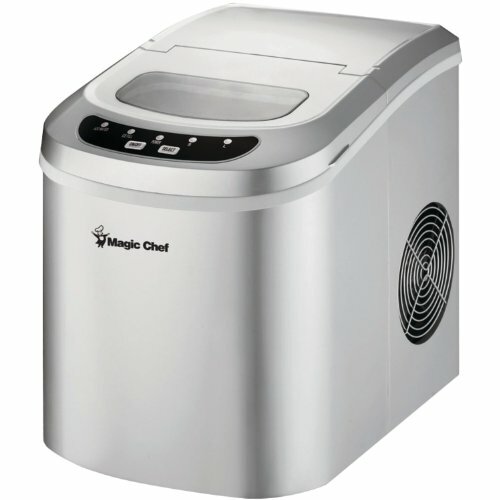 Sleek Performance-Oriented Design, Portable Stainless Steel Ice Maker. 2 Selectable Cube Sizes, Removable Tray for Easy Ice Transfer. Modern compressor refrigeration technology, see-Through Window on Top Allows for Process Monitoring & Ice Level Checking.